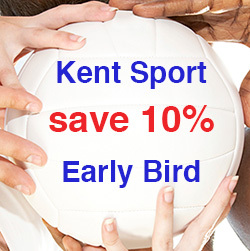 University of Kent students that purchase their sports membership for the coming academic year between 1 June and 20 September 2013 will save 10% with Kent Sport's Early Bird promotion. Early Bird participants will also be entered into a free draw, with a chance to win back the cost of their membership. With the Early Bird offer, Gold membership is £175.50 reduced from the normal price of £195.00. It includes access to all sports facilities, entry to all fitness and dance classes, unlimited visits, equipment use, seven day advance bookings, discounts on recreational courses and workshops, discounts on fitness and nutrition consultations, and access to facilities for club training and matches. Silver membership includes the same benefits, with off-peak access to the Fitness Suite (see the Kent Sport website for details). The membership will be from 1 September 2013 to 31 August 2014 and with the Early Bird offer is £148.50 reduced from the normal price of £165.00. With the £4.8 million redevelopment of the sports facilities at the Canterbury campus now complete, there is no better time to join Kent Sport. The new Fitness Suite with its state of the art equipment and three distinct areas for cardio and resistance, rehabilitation and strength and conditioning training, is a vibrant and motivating area for working out. The new dance studio can be split into two smaller spaces for more intimate classes and is fitted with the latest in light and sound technology, including four mirrored disco-balls, creating a colourful and invigorating environment for group exercise. Along with the new indoor tennis and netball centre, the three large sports halls provide opportunity for a wide range of activities such as badminton, basketball and table tennis. Kent Sport members can also enjoy two squash courts, outdoor grass pitches, 3G and astro pitches, providing a wealth of excellent facilities for our members. Enhance your university experience by joining in with the many sporting and fitness opportunities available at Kent Sport. You can find out more on the Kent Sport website and take advantage of this Early Bird sports membership offer by joining today at the University of Kent’s secure online store, or contact memberships@kent.ac.uk or 01227 823623.